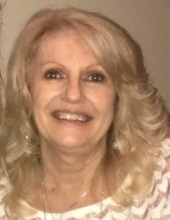 Sandra L. Janzen, age 69 of Oak Forest, IL went to Heaven Sunday, January 13, 2019 surrounded by her family. She was born August 31, 1949 in Gary, IN to her loving parents, Warren and the late Mary L. Heidkamp. Loving mother of Cindy (the late Scott) Bombacino. Adored grandmother of Alyssa and Tyler Bombacino. Dearest sister of Cecelia Swanson-O’Brien, Diana Quaid-Piazza, Glenn (Lynn) Heidkamp, Dennis (Cindy) Heidkamp, the late Kenneth Heidkamp and the late Paula Schrammeck. Dear aunt of Christopher, Matthew and Michael Heidkamp, Nina and Alex Heidkamp, Angela Adamsheck, Megan Swanson, Jason Quaid, Paul O’Brien, and Joseph Piazza. Her family was her passion. Her happiness came from spending time with her family, friends, and babysitting. She was a happy, energetic source of joy in any room and was taken from us too soon. In lieu of flowers, memorials to St. Jude Children’s Research Hospital 262 Danny Thomas Place, Memphis, TB 38105 Or American Cancer Society, 1801 S. Meyers Rd., Suite 100, Oakbrook Terrace, IL 60181. Visitation: Friday, January 18th 4:00-9:00 PM at Friedrich-Jones Funeral Home, 44 S. Mill St., Naperville, IL 60540. Prayers will begin, Saturday, January 19th 9:00 AM from the funeral home and process to Holy Spirit Catholic Community Church, 2003 Hassert Blvd., (111th and Book Rds.) Naperville, IL 60564 for a 10:00 AM Mass of Christian Burial. Interment will follow at Risen Lord Cemetery, Oswego, IL. To send flowers or a remembrance gift to the family of Sandra Lynn Janzen, please visit our Tribute Store. "Email Address" would like to share the life celebration of Sandra Lynn Janzen. Click on the "link" to go to share a favorite memory or leave a condolence message for the family.